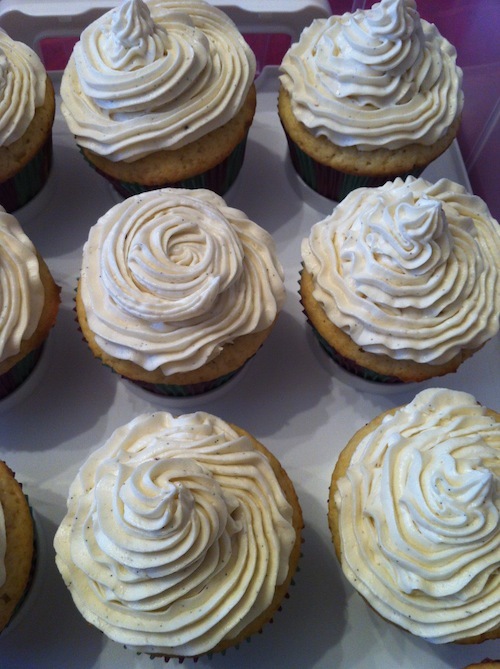 While vanilla is not my usual go-to decadent treat, Naomi’s request for vanilla cupcakes for her birthday party was the perfect opportunity for me to try out some more classic recipes. The kids seemed to like these, and the parents loved them. And even though they weren’t chocolate-y, I still thought they were deliciously decadent vanilla treats. 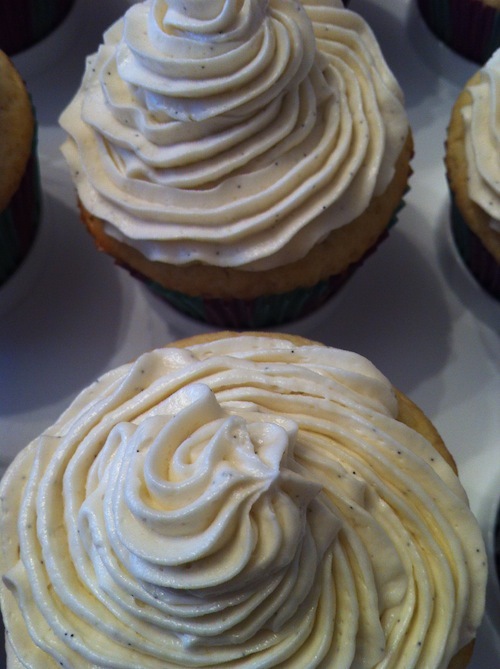 The buttercream uses a vanilla bean for maximum vanilla flavor, and adds the lovely specks to mark true vanilla flavor. The cake had a great crumb, and a strong vanilla flavor that can stand up to the intense buttercream. Preheat oven to 350°F. Line two muffin pans with 24 liners, or grease with cooking spray. In a large bowl, beat together butter, sour cream, egg, egg yolks, and vanilla. Sift in the dry ingredients and beat on medium speed for 30 seconds, or until smooth and satiny. Scrape down the sides with a spatula and make sure there are no flour pockets left. Divide batter among the 24 cupcakes and bake for 18-22 minutes, until lightly golden on top. Remove cupcakes to a wire rack to cool. Using the whisk attachment to a stand mixer or an electric mixer, whip the butter on medium-high speed until fluffy, about 5 minutes. Reduce speed to low and gradually add the powdered sugar. Once incorporated, increase the speed and add vanilla extract, then heavy cream. Whipping until fully incorporated and has reached your desired consistency. Frost completely cooled cupcakes.